So 2016 is already here, and we are sure you have all made plenty of New Year's resolutions, trying to become a better person and improve ourselves. But let's face it, we make too many resolutions, and sometimes we set ourselves unrealistic goals, whether is learning a new language, quit smoking, losing some weight or exercising more. Here at Cooking Hacks, we thought we could give you a hand to succeed in one of the most popular resolutions: stay healthy. You can start by doing something simple like walking, running a few minutes or riding your bicycle, and constantly checking your vital signs thanks to our e-Health Sensor Platform for Arduino and Rapsberry Pi. 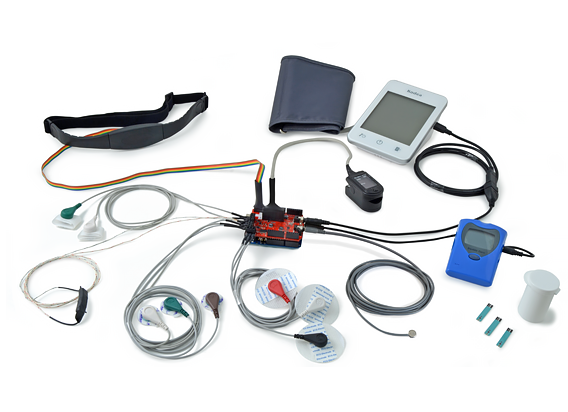 The e-Health Sensor Platform was designed as a prototyping shield for investigation and a low cost medical sensor platform, and is compatible with Arduino and Raspberry Pi. It allows you to perform biometric and medical applications where body monitoring is needed, making use of 10 different sensors that read relevant vital signs that could help you when you exercise. For example, you can check your pulse and oxygen in blood with the SPO2 sensor, or monitoring your breathing with the Airflow Sensor. You can control your body temperature, and the Electrocardiogram Sensor will allow you to know the electrical and muscular functions of the heart. The Galvanic Skin Response Sensor will let you measure the electrical conductivity of your skin (your sweating) and the electrical activity of muscles can be monitored with the Electromyography Sensor (EMG). In addition, you can wirelessly upload your biometric data to the cloud thanks to any of the 6 connectivity options available: WiFi, Bluetooth, Zigbee, 802.15.4, GPRS and 3G. Besides you can also visualize your data in real time with GLCD, KST, Serial Console and even with a SmartPhone Application. Check the e-Health Sensor Platform tutorial to know the full capabilities of this biometric shield.